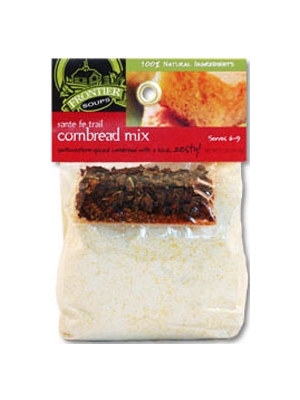 Frontier Santa Fe Trail Corn Bread Mix is a wonderful Mexican corn bread and is a great accompaniment to soup, chili or all by itself. Similar to our Appalachian Trail corn bread mix but the addition of green chilies, red ancho peppers and cayenne pepper makes a superb Mexican style corn bread. Serve this flavorful Mexican corn bread with soup for supper or with sausage and eggs for breakfast. Add corn bread mix and contents of spice packet and stir thoroughly. Pour mixture into preheated pan. Bake for 13 to 15 minutes until corn bread is firm on top and lightly browned. Prepare corn bread according to directions on package. Allow to cool. Remove corn bread from the pan. Heat barbeque grill to high. Brush each side of corn bread with olive oil and grill just until grill marks appear, about 1 minute per side. Combine olive oil and vinegar. Mix well. Add remaining ingredients. Set aside. In a large salad bowl, combine lettuce, cut-up tomatoes, onion and corn. Add vinaigrette and gently toss. Add corn bread to salad. Mix thoroughly and serve. Add cheese if desired. Remove and discard husk. Use a wet paper towel to remove silk. Soak corn in cold water for 15 minutes. Remove corn from water and shake off excess water. Brush corn with olive oil. Sprinkle corn with salt and a little garlic. Roast corn for 15 minutes, turning occasionally. After cooling, slice kernels off the cob into a medium bowl. Brown sausages in skillet, pour off extra fat, and place in bottom of 8 inch pyrex baking pan. Cover with cranberry sauce or sweet tomato relish. Prepare cornbread batter with buttermilk, eggs and melted butter. Pour batter over all and bake 25 minutes at 350 degrees. Cut in squares and serve.